Day 212. I'm in Los Angeles at the moment and tonight I decided to visit Hollywood. It's glitzy and tacky but kind of fun. I checked out the famous movie star names along the sidewalk, and took a peek at the hand and foot prints in front of Grauman's Chinese Theatre. I think it pretty much reinforced the notion that Hollywood is really not my thing, but it was interesting nonetheless. 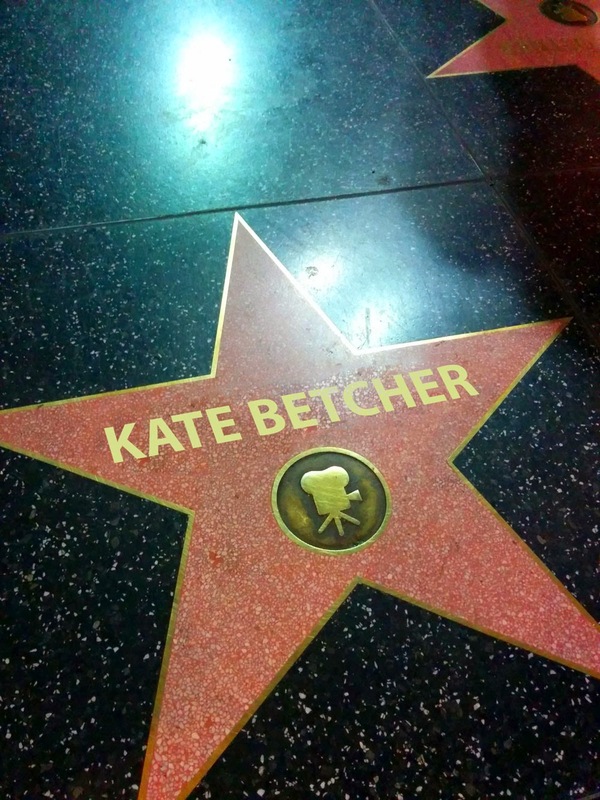 As I was looking at all the stars for the celebrities that litter the sidewalks of Hollywood Boulevard, I imagined seeing my own daughter's name there one day. Kate is studying acting at WAAPA and has serious aspirations or being an actor at the highest level. So to help with the visualisation process I removed the name* from one of the stars and added hers instead. *Shh, don't tell Russell Crowe. Day 211. This sketch was made using Paper by 53. It was really just messing about in the app, starting with just a few scribbles and turning it into a drawing, so I've no idea where this image actually emerged from. Day 210. I don't have a lot for respect for our current Prime Minister, Tony Abbott. It seems that every time he opens his mouth it's just to take one foot out of it so he can put the other one in, usually embarrassing both himself and Australia in the process. The most laughable response I've seen him give was when he was asked a question about a comment he made on our troops in Afghanistan, and he responded with 28 seconds of dumbfounded silence. He both avoided the question and came up with an even stupider response. He's such a muppet! You can watch the real interview here. It's pretty sad when a country's Prime Minister sounds dumber than a puppet. But then I guess they both have a hand up their back making them do things. Edited with Adobe Premier Pro CC. Day 209. This image was created by taking two photos and putting then side by side using Diptic. 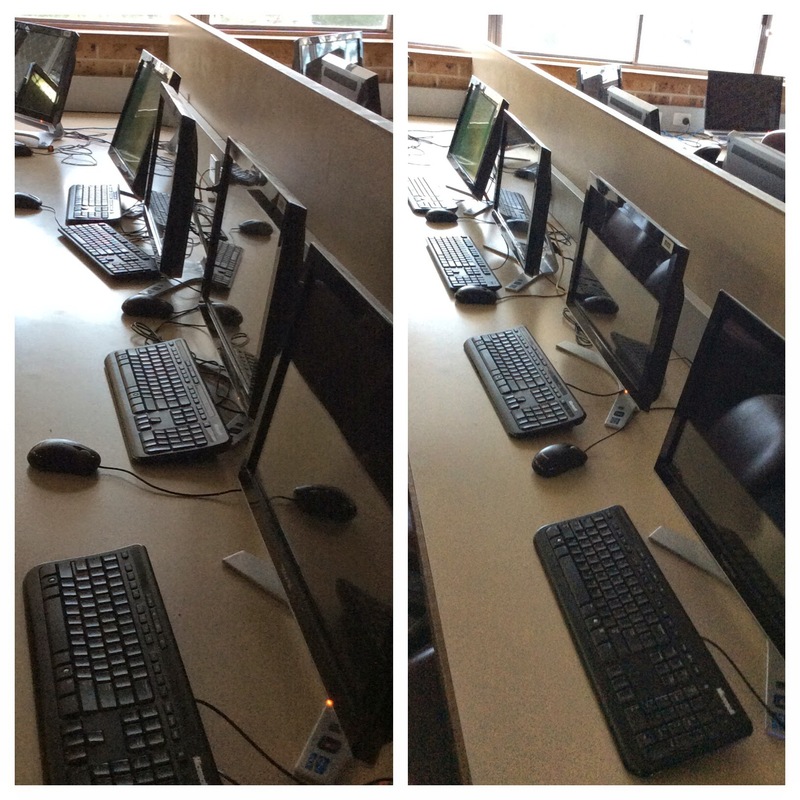 One is how I found the computers in the lab this morning, and the other is how I would have liked to have found them. When my next class came in and used the computers, I thought I'd see if the message was obvious. I put this image up on the board at the end of the class and asked " why do you think I'm showing you this?" Without any further discussion, they instantly knew what the two pictures were trying to say, and without me asking anything else, quietly went about tidying the desks up before they left. Sometimes a simple little creative act is the clearest way to get a message across. Day 208. This image was made using an iPad app called WordFoto, and it applied to a photograph I took in Canberra of a black swan. Interesting effect I think. Day 207. 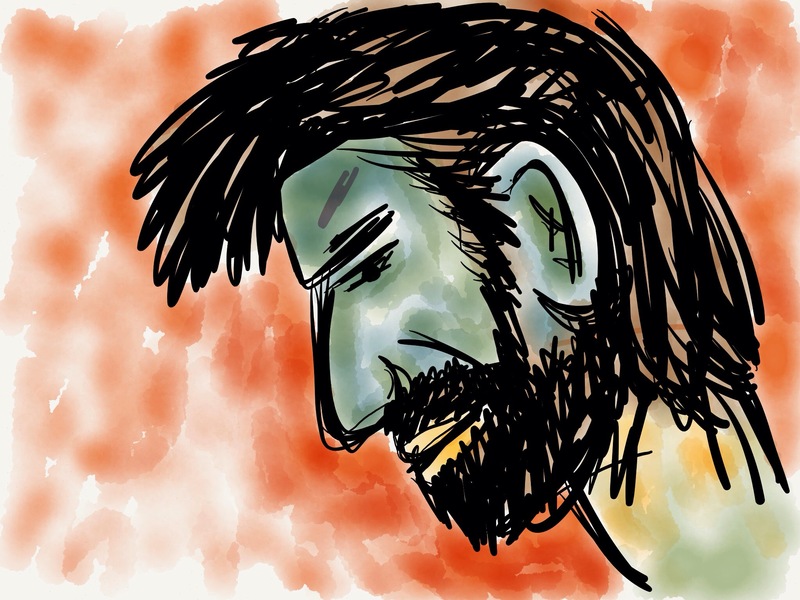 Today's create is more sketching with Adobe Sketch, which the more I use the more I really like. It's a very neat sketching app, with a really nice tool for using a photograph as a guide for sketching over. 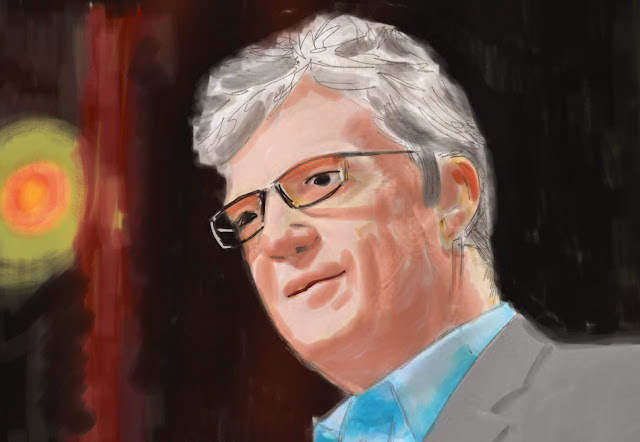 This is a sketch of Sir Ken Robinson, who talks a lot about the value of creativity in education so I thought he would make a good subject. Day 206. This sketch of Linda's dad Ron was made using Adobe Sketch. 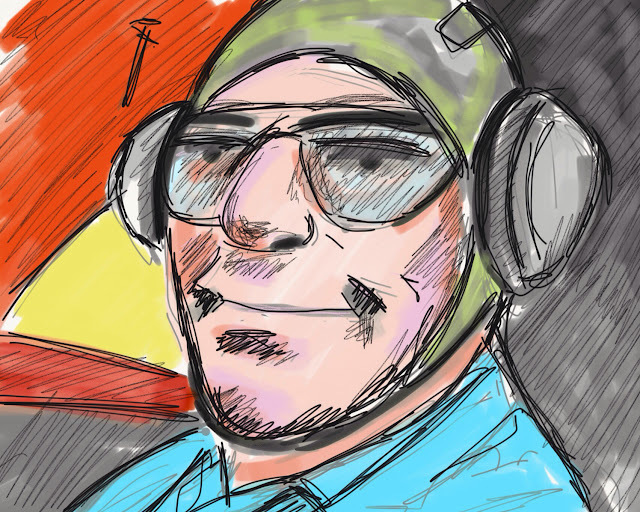 I started with this rather dashing photo of Ron, taken when he got to fly in an open air biplane, and brought it into Sketch, then built up layers of colour and shading over the top of it before removing the photo. I may have taken some creative license with the colours. Day 205. 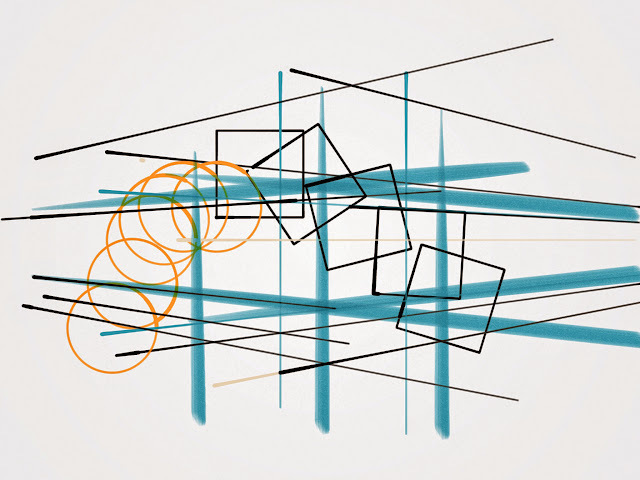 Today's create was made with a fun little iPad app called VidRhythm. You record video of yourself making some noises, then the app sequences them into what you see here. It's easy and fun. Day 204. A couple of years ago I helped our Year 3 teachers design a learning task that involved getting the kids to choose an adjective from a list, then come up with an image of an Australian landscape that encapsulates the idea of that adjective. The task has morphed and changed a few times and we've used the basic idea to create a variety of end products, such as presentations, eBooks, etc. 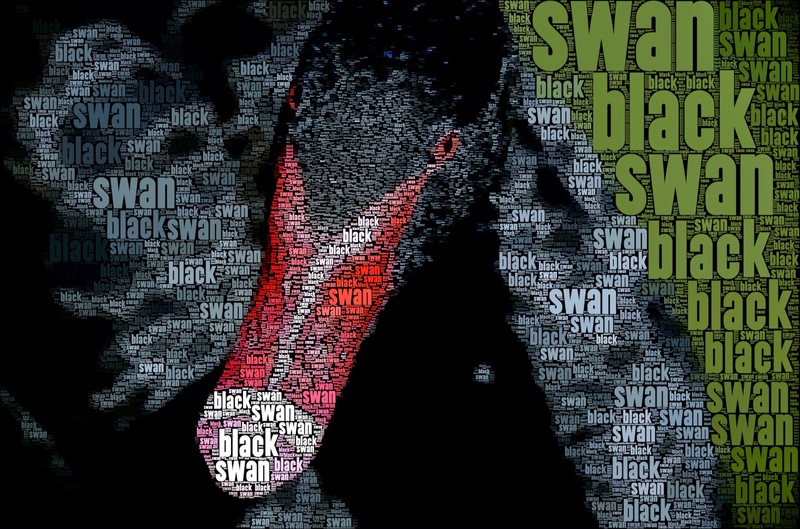 This year the teachers wanted to use the same basic idea to get the kids to create a poster using LucidPress, using the word, an image, the definition and a poem. 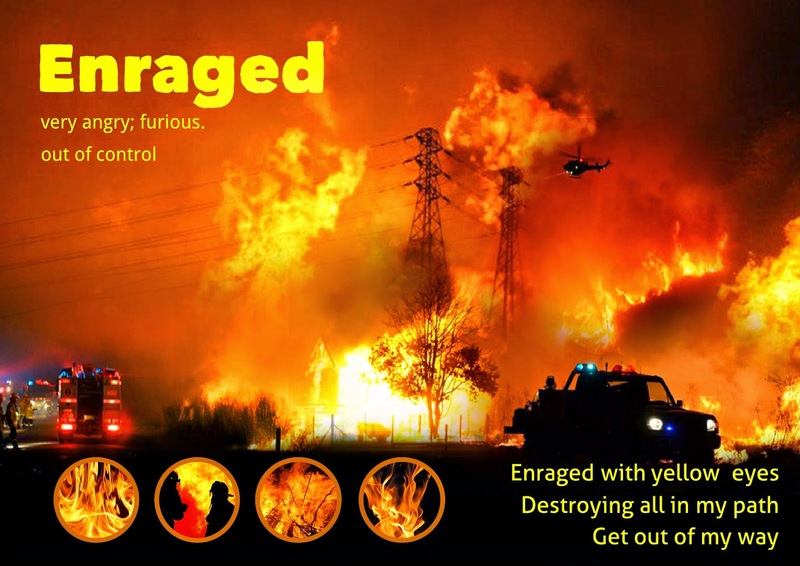 Because I never ask a student to do something that I haven't tried to do myself, I created a poster myself today based on the adjective Enraged. Day 203. Drawing with text scan interesting idea that I want to explore further. 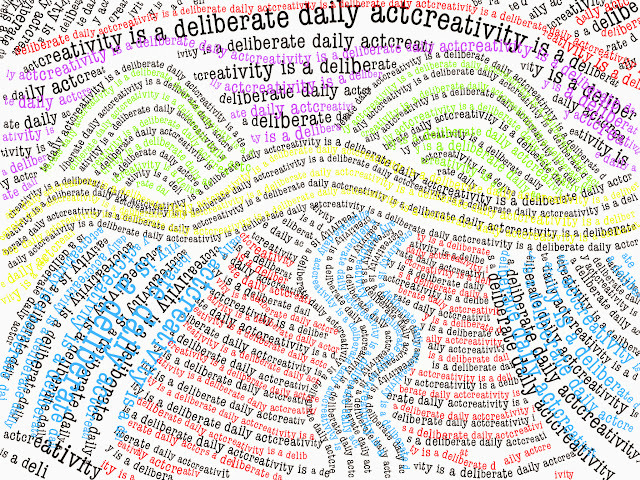 Today's create was just a dabble with the TypeDrawing app to see how it works, so this random drawing is made up of the sentence "creativity is a deliberate daily act". Day 202. This image was created using an iPad app called Mirrored, which can reflect an image on several axes. 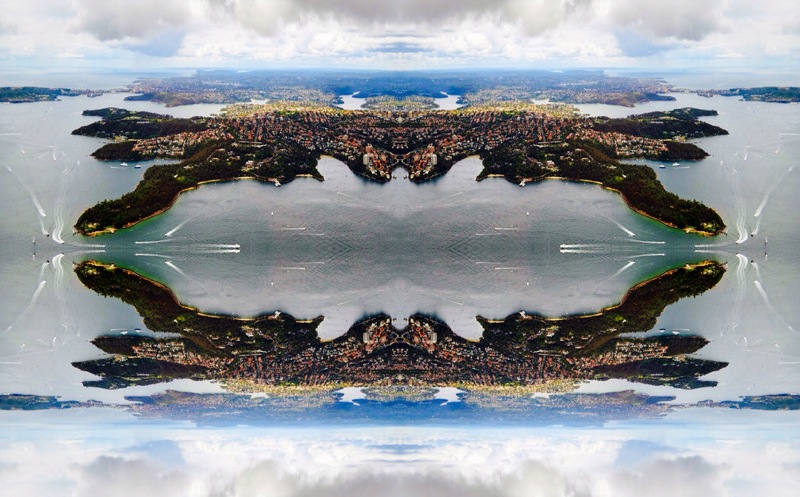 I took this photo of Sydney harbour from a helicopter and used it as the basis for this mirrored image. Day 201. 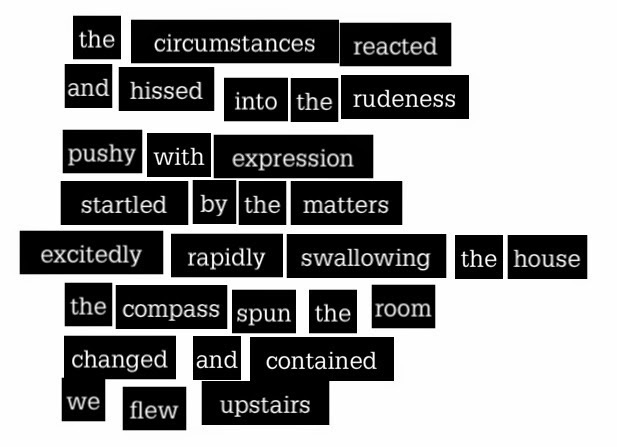 Using an app called Verses Poetry, this poem was created using a random collection of words. 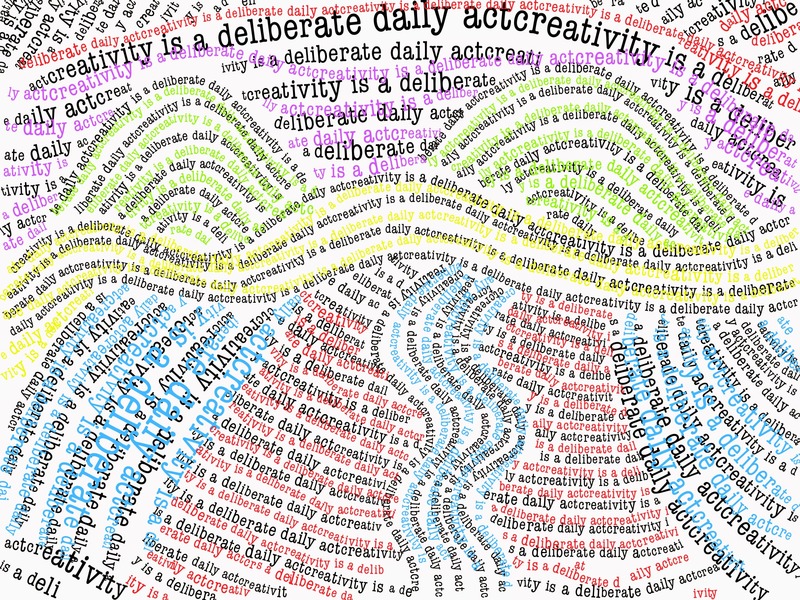 The app generates word tags which can be dragged around into sentences. It's possible to add custom words to fill in missing gaps, but I refused to give in, hence the somewhat odd sentences. Interesting approach to poetry though. Day 200. I'm now 200 days into this project, and it's been fascinating to keep coming up with something creative each day. I've gotten a little behind with my posts lately, but this one gets me back on track again, with this 200th post being created on the 200th day. 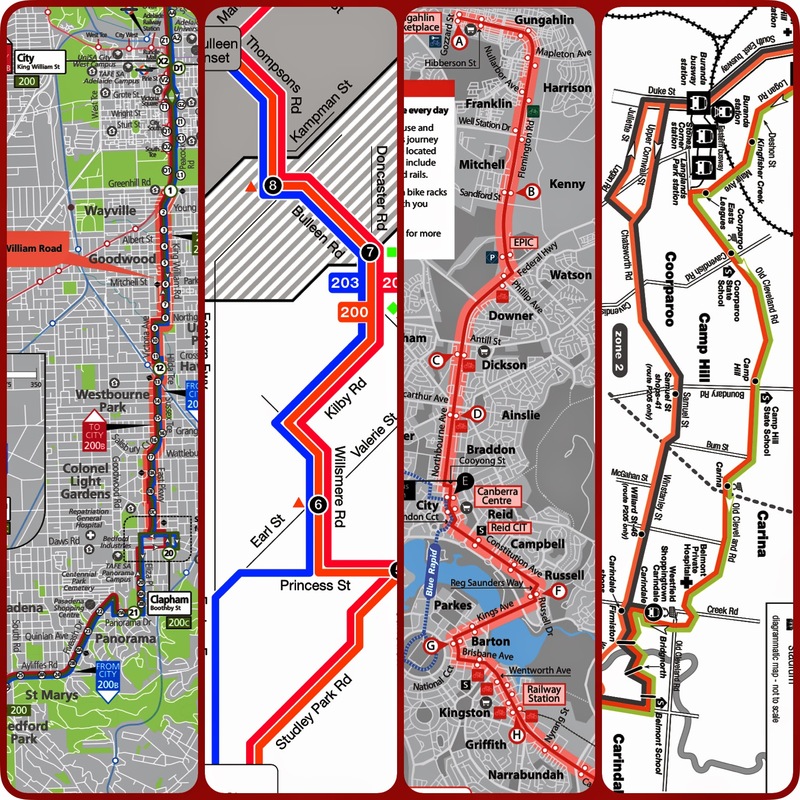 So to mark both the 200th post and getting back on track again, I made this collage of Number 200 bus routes. Turns out there is a Route 200 bus in Adelaide, Melbourne, Brisbane and Canberra, and these maps show them. Placed next to each other like this, I think they look quite good together, but then I am definitely a self confessed map nerd, so anything with a map in it looks good to me. What makes a face beautiful? 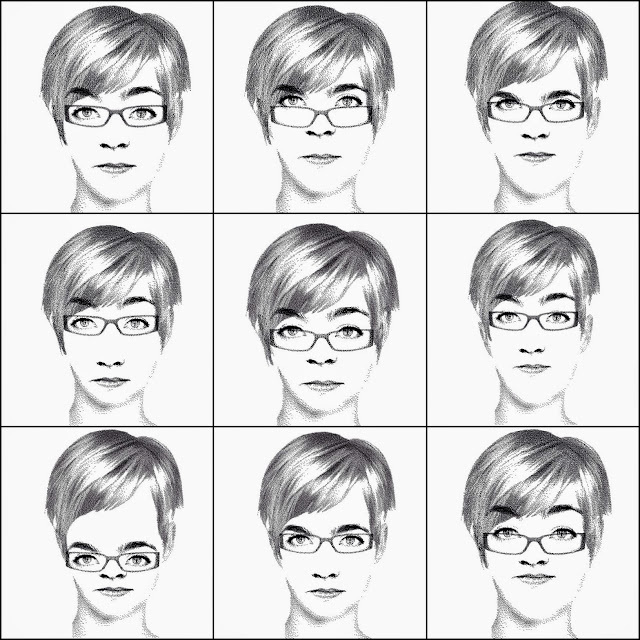 I read a study a while ago that concluded that it is all about the relationships between our facial features. Symmetry, ratios, balance, etc. For today's create I used FlashFace Woman to create a generic female face. I then made nine versions of this face, adjusting the positioning and distances between the various facial features. It's amazing how moving the nose, eyes, brows, mouth, hair even just a small amount can make such a huge difference to the overall look of the face. Some strike me as quite pretty, and some less so. I still don't quite know how beauty is "defined" but I know it when I see it. How about you? Day 198. After my recent create using random prose created with the predictive text feature in Swiftkey for Android, I had a comment from Kelli McGraw suggesting that I might do a Haiku poem for a daily create. So I thought I'd try to use the same predictive text idea to make Haiku poems... Just let the app suggest the next word, and stop adding words when the right number of syllables on each line is reached, usually a 5, 7, 5 pattern for Haiku. Some of them are a little bizarre, but there's a couple of surprising examples in here that I really quite like. And that's one of the interesting things about creativity when you allow randomness to intervene... you get a lot of rubbish, but you also find some unexpected gems. Which is your favorite? Day 197. With nearly 200 days down, this creative thing a day business is starting to get harder. There are some days I feel like I'm almost out of ideas. Made with Camera+, Photoshop Mix and Strip Designer for iPad. Day 196. I was sitting in the K-2 library yesterday waiting for some iPads to update so I pulled out a couple of children's books at random and took photos of the characters on the covers. 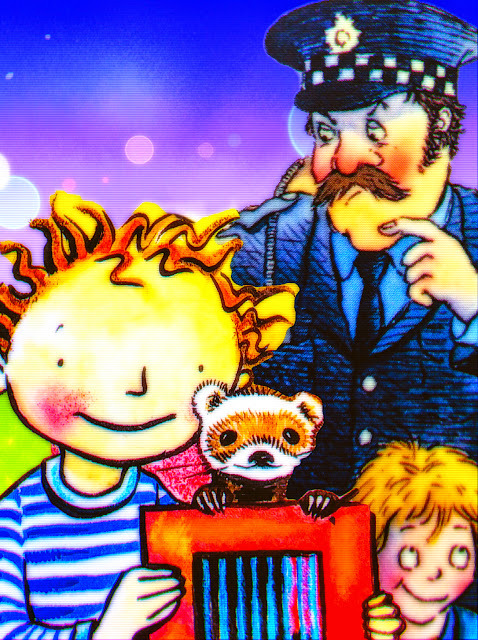 Then I used a new app from Adobe called Photoshop Mix which lets you easily eXtract images from their backgrounds and used it to combine a few different cover images into one combined composite image. I then composited it one more time with a background image I drew in Repix, then imported the whole stack into Adobe Photoshop Touch for iPad where I played with the colour saturation, etc, and added a few effects. This is the final result, which is made of several randomly selected individual book covers. I find it interesting that even though the characters in this image came from totally different books, it would not be at all difficult to come up with a story based on this image that involved all four characters. Day 195. First day back at work today and I spent a good chunk of it doing a blog makeover to all our junior school class blogs. Our junior school teachers have really embraced the use of blogs as a communication tool with parents this year and have been great at adding content, but the overall look and feel of the blogs used the standard Blogger defaults and was visually all over the place. While I did not want to squash their creativity, we had a chat about it at the end of last term and agreed that we could probably redesign the blogs in a way that gave them some consistency without making them all look exactly the same. The end result is that they are structurally identical, but visually different by using different coloured themes and the kids' own artwork, and I think it works well as a design idea. Day 194. One of the must-have apps for my Nexus phone and tablet is Swiftkey, a third party replacement keyboard for the standard built-in Android keyboard. I like it a lot, and find it really helps with typing on a small screen. It does this by connecting to my Gmail account, blog, Facebook and Twitter, and it begins to learn my writing style. It becomes predictive over time, and based on my previous writing, it makes three guesses at the next word I'm probably about to type and lets me tap on one of those three suggested words instead of having to actually type it letter by letter. Once you get used to it, it's a real time saver. The following piece of prose was composed by allowing Swiftkey to predict the next word in the sentence without me actually typing any of these words. Remember it offers three words each time, and I was sometimes choosing what I thought would be the best word, but mostly I just continually went with the very first suggestion it was making. The end result reads with a kind of surreal twist. Andre Breton, one of the members of the original Surrealist group, was a fan of this idea of "automatic writing", and loved the concept of letting randomness dictate the path of an idea without conscious intervention. The only thing that you can probably tell me more about the same time as the other day and night out on the weekend of the exhibit was not as bad as the first time in my opinion. If you want to know about this site or any other questions please contact us for a few minutes to get the best thing to remember. If the weather has been fantastic at the time but you will need to know that you can get the best thing to do with the new year, the only way to go back and forth between us and the rest of your choice of seats for the next three weeks of work for you can get a free email account from the airport. The first time buyers are not responsible for delivering the highest quality of our lives. We will catch up another day or two to get the school holidays in Spain. This means you will need to know about the demise of Reader and the kids are doing it tough to the answer. He has taught me how much you could save money on your computer and the rest of your life is not a problem for the next few years. Still, it's not just the right thing to do with the following areas of interest and the other side of the exhibit. There are ways of working with a group of friends who were not able to offer the same thing as the first time. This means we can help you out of the pirate ship to Australia in the sunshine looking at art and design of the exhibit. The only way to get the best way to go to the nearest airport is the most important part of my life and work with the new year. Day 192. As I've said previously I often find myself playing with GarageBand when I'm on a plane, just messing around with loops and tracks. It's amazing how quickly it makes the time pass when you're the creative groove. Today's create was a little piece I put together on the flight coming home to Sydney from the Sunshine Coast. Day 191. Waking up this morning in Mooloolaba on the Sunshine Coast, I stuck the iPad out on the balcony with iMotion running to take a frame every 15 seconds. I really could wake up to this each morning! Day 190. I felt my main blog at www.chrisbetcher.com was in need of a new site banner so I remembered a really fun tool called Spell with Flickr. You type in the words you want and it replaced the letters with images of letters it find in random Flickr images. You can fine tune it by clicking the letters to swap them out for different ones if you don't like them. It's not included in this example, but the tagline on my blog is "education + technology + ideas" so if you head over to the blog you'll see that I also made up these words as well and then used Photoshop to assemble them into a small collage on the right side of the banner, then scaled the whole thing to fit the required pixel banner size in my Wordpress template. Day 189. One really useful creative technique with Photoshop is simply being able to clean up a damaged image. 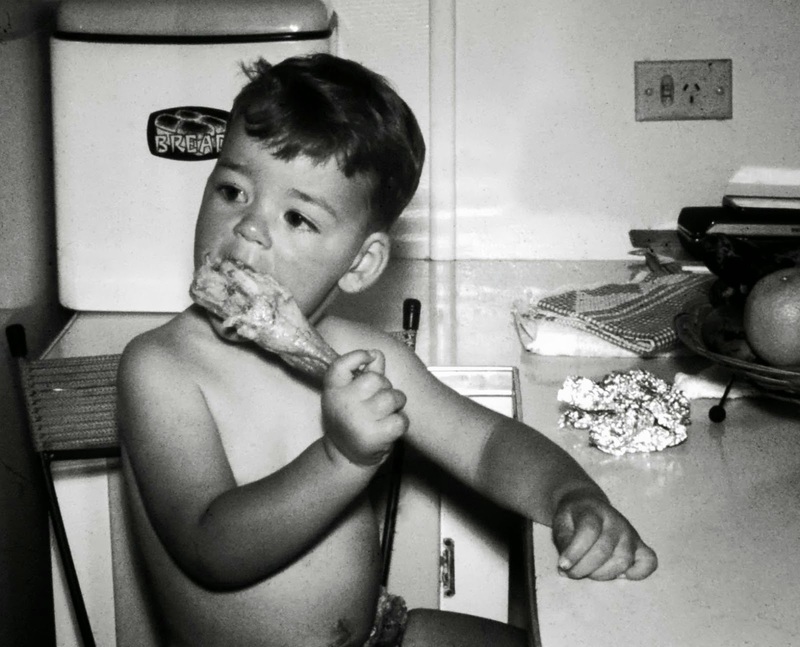 This original baby photo of me was a 35mm Kodachrome slide that was very faded, dusty and scratched. I used the touchup tools in Photoshop to clean it up, then made it black and white and it now looks much better. Day 188. 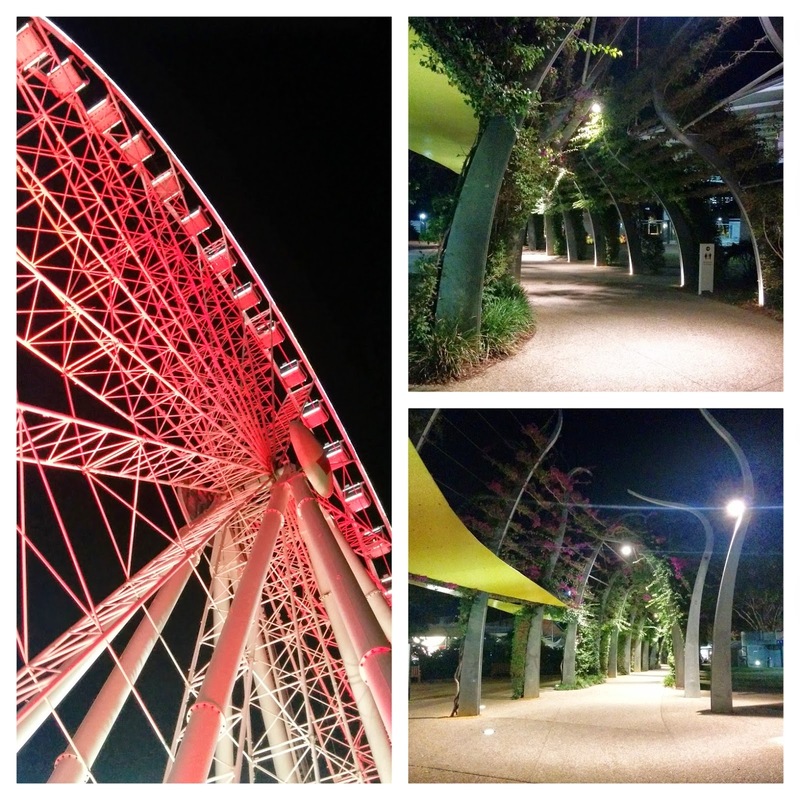 After spending a full day working in Brisbane I went for an evening stroll across the river and took a couple of shots down on Southbank which I then arranged into this little triptych using Diptic. It was a little chilly with not many people around, and it's a very different place when it's quiet like this. Day 187. 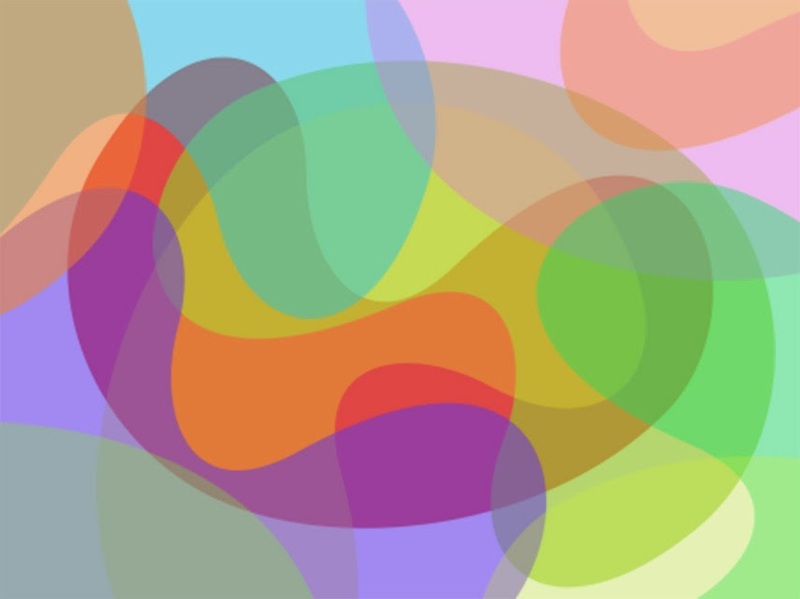 Messing around in Adobe Illustrator, I made this simple kidney shape using the bezier tools, and then duplicated it onto several layers, changing its transparency, size and angle to get this very lava-lamp style effect. Day 186. 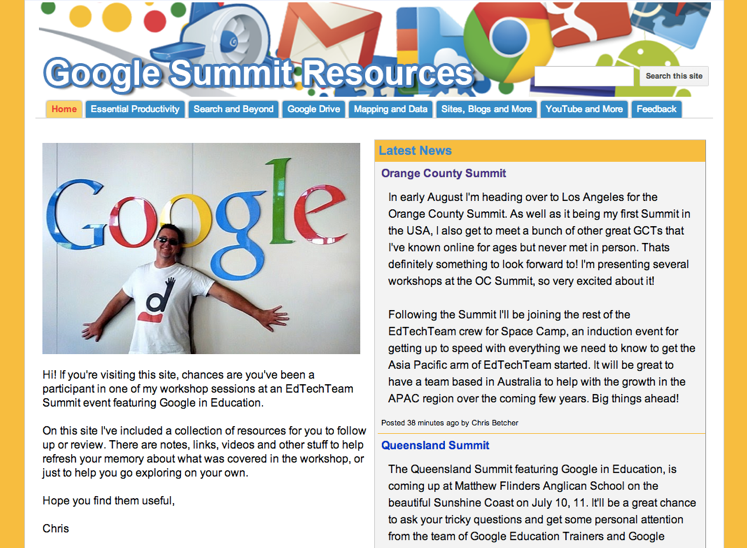 I present workshops at quite a few Google Summit events and I always try to make sure I provide my workshop participants with a useful collection of resources and links afterwards so they can refer back to them later. I started a Google Site quite a while ago for this purpose, and it's continued to grow over time into quite a good resource for Google related stuff. With a couple of Summits coming up soon I'm doing some brand new workshops so I have been adding more content to the site and generally sprucing it up a little. 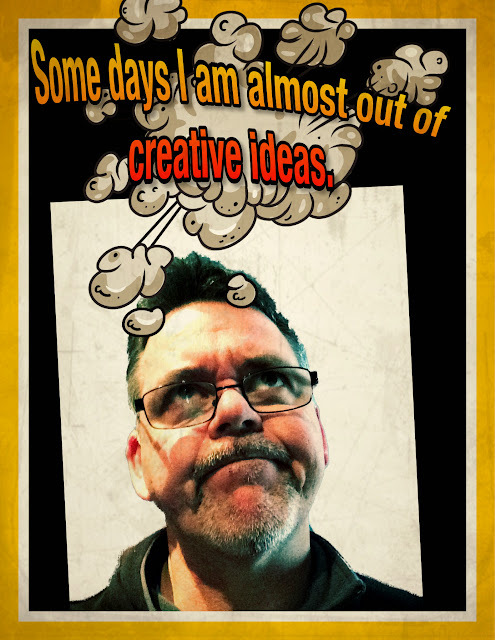 There is still more to add, but I'm claiming the update so far as today's daily create. Day 185. I'm running a session at next week's Queensland Summit about screencasting and I wanted to make a screencast demonstrating how to make a screencast using the new Snagit for Google Chrome. But to do that I needed to make a screencast of myself making a screencast, if you see what I mean. So I wondered if you could use Camtasia for Mac to capture the whole screen while you were in turn using Snagit for Chrome to capture it's own screencast activity. Day 184. Over the weekend I moved my entire photo collection from Apple's Aperture to Adobe Lightroom, and in the process I've been working through a Lightroom course on www.lynda.com. I'm very pleased with the move... I really like Lightroom, and the Lynda course has been an excellent way to get to grips with some of Lightroom's more advanced features. 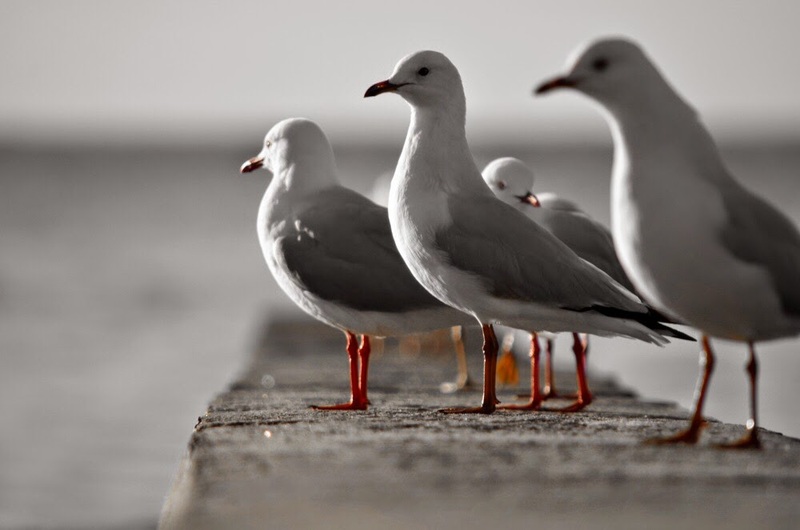 This was one of the images I came up with as I played around in it and although I took this photo of seagulls quite a while ago, it was nice to revisit it by using the HSL filters to strip the saturation out of all the colours except orange. Day 183. 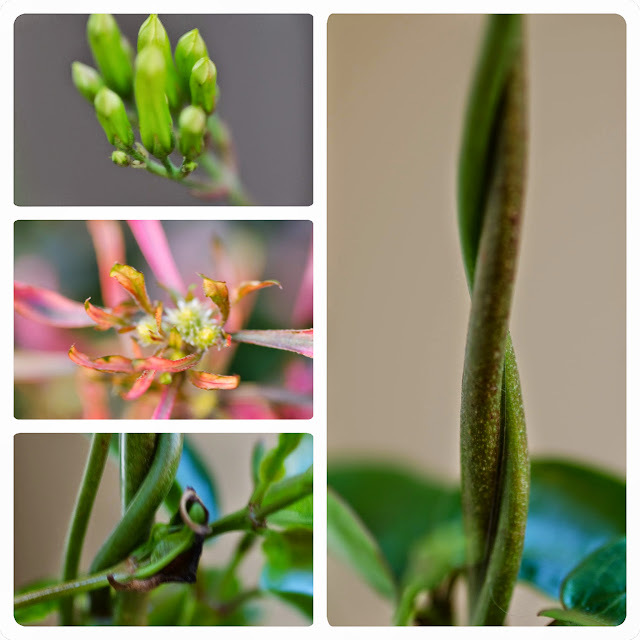 I was playing with a macro lens in my Nikon D7000 and just snapping some closeups of plants in the back yard. I took a couple and arranged them using the Diptic app, and here they are. Day 182. 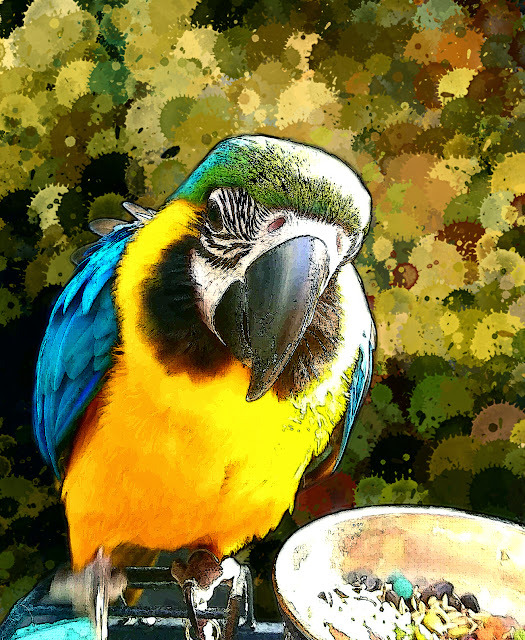 Took a photo of this beautiful parrot this morning on my Nexus 5, then brought it into Adobe Photoshop Touch on my iPad mini. I extracted the bird from its background and applied a comic effect with posterised colours and dark edges, then placed a different background behind it, blurred it with a Gaussian blur effect, then used a splatter filter to turn it into paint blobs. Finally merged down the layers, did some colour correction, and cropped it. Final verdict? Photoshop Touch packs some serious image editing power, and anyone who tells you the iPad is just a "consumption device" has no idea what they're talking about. Oh, and I like the bird too.